All my inspiration comes from the natural world or representations of nature, be it decoration on a medieval pot or a Babylonian measure of weight in the shape of a duck. I am equally happy nosing around a museum with a sketch pad, as out and about with a pair of binoculars. 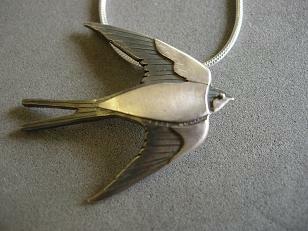 I am fascinated by the design possibilities of bird plumage and a lot of my work to date has had bird themes . 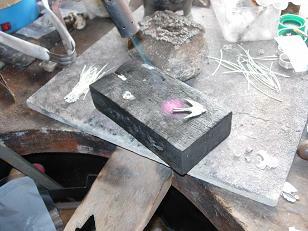 However, a recent encounter with some enchanting Pipistrelle bats led to a whole new range of bat jewellery. Essentially self taught, I work on the flat. 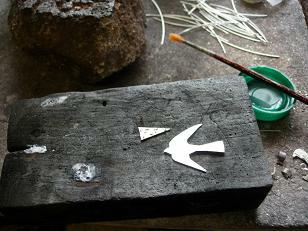 The shape of the piece is sawn from a sheet of silver and then built up a layer at a time. 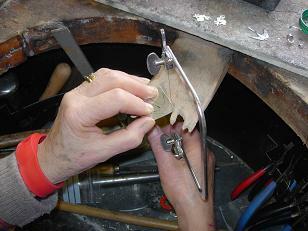 The areas to be applied are cut out with very sharp snips and then soldered into place. 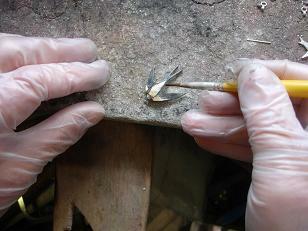 The last details are made with fine silver wire. The dramatic black and white "wood cut" look is achieved by oxidising the background and polishing the foreground with a selection of mops and brushes. 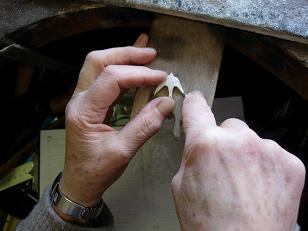 These hand made pieces are a real joy to work on and make me want to get up in the morning.